Readers embraced the characters of Wendy’ Wax’s highly praised Ten Beach Road, which USA Today cited as “one of six books that belong in your beach bag. In 2012 they hailed their return in Ocean Beach. Now, with Christmas at the Beach, Wax’s first e-original and her first novella, she brings back the women of Bella Flora in an all-new holiday novella. Synopsis: When Madeline Singer, Avery Lawford and Nicole Grant were deeded ownership of a crumbling historic home on Pass-a-Grille Beach, all they dared hope was that renovating and selling it would let them rebuild their lives and the bank accounts drained by a Ponzi scheme. Together, they returned the house, Bella Flora, to its earlier glory. Along the way, they forged friendships, discovered unexpected truths about themselves and each other, and gave birth to a DIY reality television show, Do Over. Though Christmas at the Beach brings readers up-to-date on these well-loved characters and sets the stage for Wax’s next novel, The House on Mermaid’s Point, its focus is 24-hours at Bella Flora, where friends and family are gathered for their first and last Christmas at the recently sold property. There’s plenty to celebrate. In addition to being back together, Do Over is going into a second season, family rifts are healing, and it’s Dustin’s first Christmas. Dustin is the child of Madeline’s daughter Kyra and of married–not to her–superstar actor Daniel Deranian. Kyra’s hope that the visit will include respite from the paparazzi that hound them is quickly dashed, but Bella Flora nonetheless provides a haven. It’s going to be a wonderful holiday. Or it would be if a string of bad news hadn’t begun trickling in. And if they hadn’t learned that their beloved Bella Flora’s buyer is the absolutely last person who should ever own her. 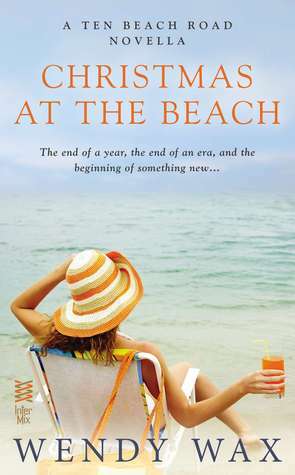 My take: Christmas at the Beach sets up the next novel in Wendy Wax’s entertaining series which is expected in 2014. The cast of characters find out the location of their next reno project. Along with that we get brief updates of the women of Ten Beach Road and Ocean Beach. There are changes coming! Wendy Wax packed a lot into her novella which made me excited to read the next book in the series: The House on Mermaid Point – there’s a preview included. I can’t wait to see what’s in store for Madeline, Avery, Nicole, Deirdre and Kyra. An added bonus is the inclusion of the first two chapters of While They Were Watching Downton Abbey – Wax’s most recent stand alone novel. I really enjoyed that book! Award-winning author Wendy Wax’s work, including While We Were Watching Downton Abbey, Ocean Beach and Ten Beach Road, has been highly praised. The Atlanta Journal-Constitution says she “writes with breezy wit and keen insight into family relations.” Her novels have been featured in national publications such as USA Today andWoman’s World, and online at sites such as On A Clear Day You Can Read Forever, Luxury Reading, and Book Reporter. The author of nine novels and a novella, Wendy’s work has been sold to publishers in fifteen countries, including the U.K. where While We Were Watching Downton Abbey was recently published. Her novel, Hostile Makeover, was excerpted in Cosmopolitan magazine.